After over three years in loyal service the old design of the Racketlon.com startpage has now been replaced with a new one.The design has been performed by the Canadian web agency inSite interactive (see their homepage at www.i2.ca ), that was assigned the task after their excellent job for www.racketlon.ca during the 2004 Canadian Open. Old friends of Racketlon.com will still recognise the structure since this has been kept almost unchanged although the sections of the previous startpage have been moved onto six different subpages for easier navigation. Instead, it is mainly the appearance of the page that has been changed in order to give a more professional impression that will better match the image of an increasingly established sport. It is anticipated that this, together with a sponsor section of enhanced visibility, will have a better appeal on sponsors. This design shift comes at a time when Racketlon.com is close to welcome its 100 000:th visitor! At this moment there have been over 80 000 "unique" hits ("unique" means that several visits during the same session (of e.g. MS Internet Explorer) are counted as only one)- out of which about 30 000 have occured during the last five months(!) As seen below, on an average day, Racketlon.com now receives between 100 and 200 hits. And note that these are monthly averages. On a single day the hit rate has peaked on well over 400 hits. 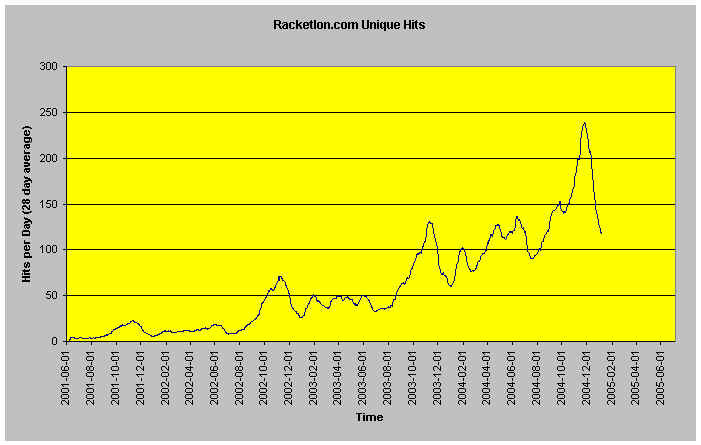 In fact, the Racketlon.com "hits per day" diagram is one of the best illustrations one can get as to the growth of Racketlon. Every new visitor means a small step forward for Racketlon. The old design is still available for nostalgic reasons and for comparison at http://w1.webbhuset.se/racketlon_com/rackhome.041231.html - but will no longer be updated.